NUCCA is the technique of the National Upper Cervical Chiropractic Association. NUCCA aims to improve the balance of your spinal alignment, from your head to your hips, by using the least amount of force, and as few adjustment as necessary. We do this by examining and adjusting one of the most powerful areas of the spine, the upper cervical spine–the upper neck. This area of the body is very unique, as it is one of the most movable and dynamic joints of the body. Misalignments in this area of the spine can cause changes in body balance and function. We call this the Atlas Subluxation Complex. The emphasis of NUCCA is on balanced posture and chiropractic adjustments that create stability in the spine. What happens when the atlas is misaligned? Head to toe, muscles of the body become unbalanced, leading to unequal pulling on spinal vertebrae and painful “fixations” in the spine. There is a twist in the pelvis and hips, creating the appearance of a “short leg” and the spine loses its stable base. Unequal weight is carried on each half of the body, leading to joint aches and pains as the body breaks down faster on one side than the other. Finally the quality of the blood flow (nutrition) to important nervous system tissue in the spinal cord/brain stem is affected, negatively impacting internal organ systems, creating multiple and often confusing symptoms. By carefully restoring head and neck alignment, the body can halt and begin to reverse the effects of spinal stress. Body balance is restored. What happens after we correct the upper cervical misalignment? 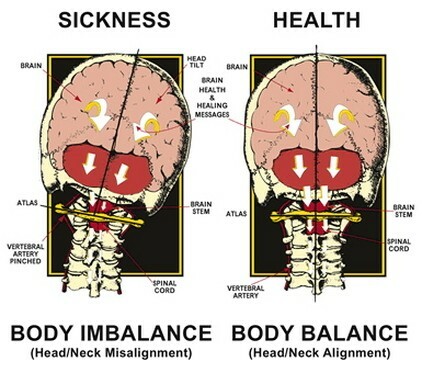 By carefully restoring head and neck alignment, the body can stop and begin to reverse the effects of spinal stress. Especially when the body is able to hold the new alignment for longer periods of time. We want to adjust you the least amount possible. NUCCA upper cervical chiropractic in research and in the media. As a chiropractic technique, NUCCA has been featured on Good Morning America and Discovery Health.